MONTREAL - It is hard to imagine a classier hockey player, on and off the ice, than Jean Beliveau. "Like millions of hockey fans who followed the life and the career of Jean Beliveau, the Canadiens today mourn the passing of a man whose contribution to the development of our sport and our society was unmeasurable," team owner Geoff Molson said in a statement posted on the Canadiens' website. "Jean Beliveau was a great leader, a gentleman and arguably the greatest ambassador our game has ever known," Molson added. "Meeting him is not like meeting other stars from the old days," said Beliveau’s former linemate Gilles Tremblay. "When people see Bobby Hull, they say: 'Hi Bobby.' When they meet Big Jean, it's always: 'Hi, Mr. Beliveau.' He commands respect." 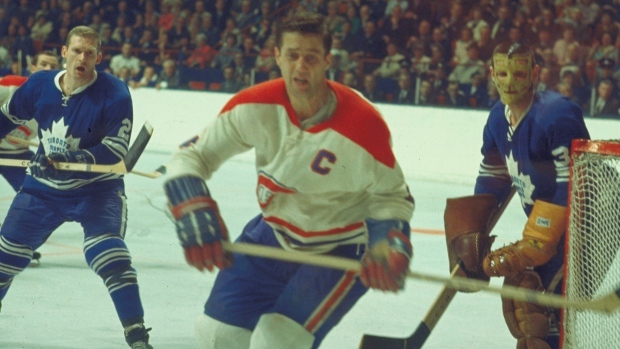 Tremblay, who won four Stanley Cups with Beliveau in the 1960s, died on Nov. 26 at the age of 75. Just four days later, former defenceman, coach and executive Pat Quinn died at the at age 71. The failing health of Beliveau's rival and fellow legend Gordie Howe has only added to a somber mood around the NHL. Canadiens fans who revered Beliveau were given a scare in 2000 when he was diagnosed with throat cancer, but after losing 30 pounds during treatment and enduring "the worst period of my life," he recovered and was soon back in his familiar spot — attending nearly every home game with his wife Elise in the seats among the fans. He also survived a stroke in 2012. A resigned general manager Frank Selke Sr., when asked what it took to sign Beliveau, simply said: "All I did was open up the Forum vault and say: 'Help yourself, Jean.'" When Victoriaville's junior team folded, he moved to Quebec City and began filling rinks around the province. When he moved up to the senior Aces, he was said he be earning $20,000 in salary and endorsements on what officially was an amateur team. His rookie season was spoiled by injuries. Although he rebounded with 37 goals as a sophomore, he was criticized for soft play and failing to retaliate to opponents' cheap shots. That season also marked the beginning of the Canadiens' record string of five consecutive Stanley Cup titles, on a team that also had Richard, scorers Dickie Moore and Bernard (Boom Boom) Geoffrion and two innovators — rushing defenceman Doug Harvey and wandering goaltender Jacques Plante. In a 2011 interview, Beliveau said he would not have quite the same size advantage in today's NHL. ''I'd only be average,'' he said. ''Way back 40 or 45 years ago, at 6-3 there were not too may of us. Beliveau's slapshot, with a lazy-looking half wind-up, was deceptively hard. Don Marshall, a checking forward for the Canadiens in the 1950s and 1960s, said even Beliveau's teammates were in awe of his skill. "It was such a pleasure to watch him play and handle the puck," said Marshall. "He was so graceful on the ice. "You knew that when your team needed a goal, he’d be on the ice with Richard or (Bert) Olmstead and you knew it could happen." The one that got away was 1967, when Montreal desperately wanted a Cup to celebrate the city’s world’s fair, Expo 67, only to lose in the final to Toronto in what remains the Maple Leafs' last championship. "We lost to Toronto in 1967 and I was disappointed because I thought we had the better team," Beliveau said years later. It may not be coincidence that it was after Beliveau stopped going to the office every day in 1993, when he "retired" to become a part-time public relations "ambassador," that poor decision-making set in and the Canadiens began a slide into mediocrity.